With stunning views of the ranges and a gorgeous setting, Elmswood Estate is the perfect spot for your wedding. As unique as the estate wines made on the property your wedding at Elmswood will be bespoke and beautiful. 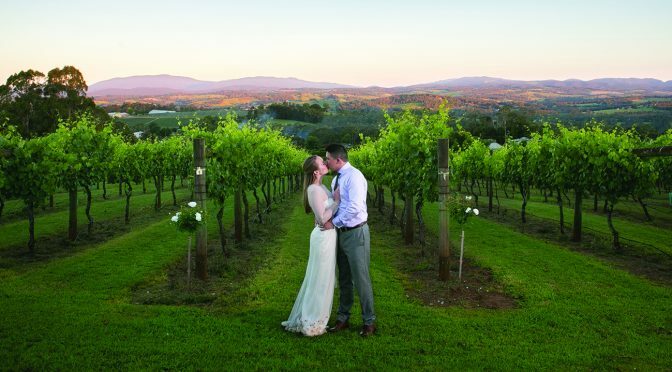 Situated in the Upper Yarra Valley at Seville, Elmswood Estate features two adjoining event spaces – both are highly versatile and functional to suit your needs. They offer an intimate, unique and rustic setting for your wedding and are temperature controlled for year round comfort. The Pavilion is a glass-enclosed building with spectacular views of the Yarra Ranges from every angle, perfectly suited for more formal, sit-down events. The Marquee is a semi-enclosed space, again with wonderful views and the added benefit of either a sheltered or open-air deck, providing an ideal setting for wedding ceremonies, a band area, or open space to dance the night away. There is also a fully equipped commercial kitchen on-site for all of your catering needs and a menu accompanied by the estate’s award-winning wines. The team can adapt to your individual needs. There are multiple sites for your wedding photo shoot and your guests will enjoy the proximity to numerous accommodation options located nearby.